Iowa had a mostly cold, rainy April this year. On April 17th we got a big storm--much bigger than I thought it would be. Unfortunately for me I was out running errands that morning, so I couldn't enjoy the storm from the comfort and safety of home. I don't think I've ever driven through rain that was so heavy and relentless. I got completely soaked when I ran to and from my car, and I ended up staying at Bed Bath & Beyond for at least three times longer than I needed to be there, walking around the aisles listening to the rain pound against the roof and the wind howl while it was dark as night outside, hoping that the storm would pass. Finally I left because I had to get home in time for Sam to be dropped off from preschool. A number of roads were flooded and I had to turn around a few times to find safer roads to drive home on. There was heavy wind, thunder, lightning, some hail, and of course the rain was pounding down so hard at an almost horizontal slant at times. I was worried that a tornado was going to crop up, but fortunately that didn't happen. I was so relieved when I drove into our garage safe and sound, and when Sam got home soon after that. In our almost three years of living in Iowa, I'd never seen a river appear in our backyard until that day. Our swingset was surrounded by at least an inch or two of water. Only that one was way better and it was supposed to be surrounded by water! Peter brought me home a bouquet of pretty cream-colored roses one day. 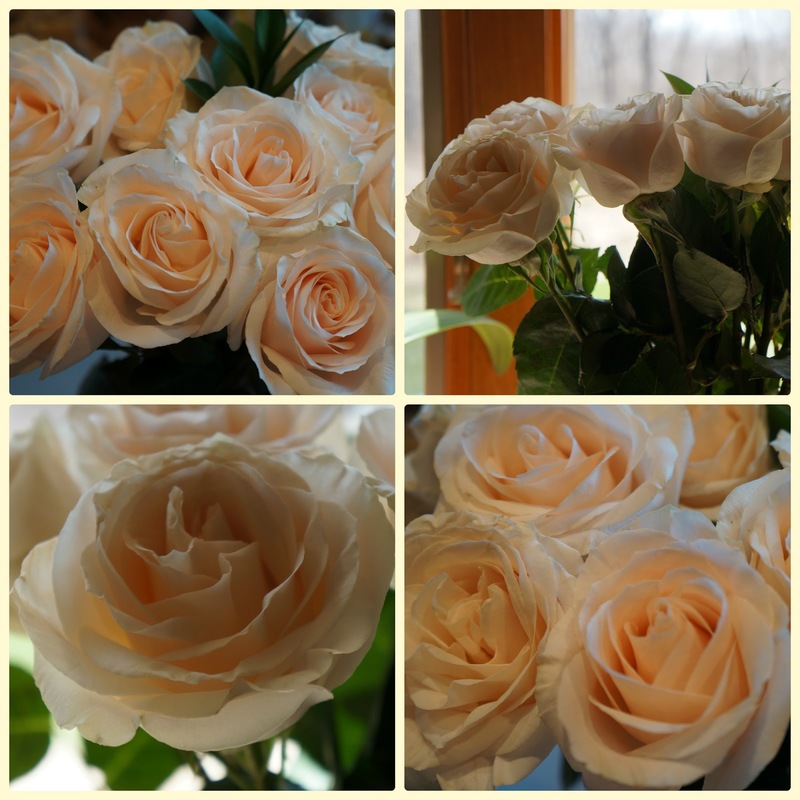 Roses are my favorite flower and I love to photograph them when they bloom in all their swirly beauty. There was a really cool full moon one night. I need to learn how to take good night pictures on my camera. Sam was chilling out on our bed one day while I was upstairs doing some spring-cleaning. It was such a lovely day (finally!). I love our bedroom, especially in the afternoons when it's full of light. The blanket that he's lying on top of is so soft. Our comforter was at the dry-cleaners. I think it's definitely worth it to invest in good quality bedding because sleep is so important to health and we (hopefully) spend over one-third of our lives asleep! I love our four-poster bed. We bought it as newlyweds when we lived in New Jersey as a reward for me having just gotten my first real professional job out of college with a salary and benefits (it was an editing job at a publishing company). We could replace it with something king-sized now, but I don't want to. I love it too much. I'd be fine with having this bed for the rest of my life. Sam brought home this cool life cycle of a caterpillar from preschool. I'd never seen it done before like this with a kernel of corn and pasta shapes. How clever! I think it's amusing when kids put their shoes on the wrong feet and have no idea they're on wrong. Here are my own feet (with the shoes on the correct feet! Yeah!). On the last day of April it was hot enough that I was wearing a skirt, t-shirt, and my cushy flip-flops. I love warm weather! Remember my living room redecorating plans? I've been working on them! I replaced the cheap ficus tree from Wal-Mart with a nicer one. Here's the old tree. It's now in the basement rec room, where it looks rather nice. I like the effect that greenery can have on a room, even when it's fake greenery. I'm all about the convenience of artificial plants! This is the new tree. It's sturdier, taller, and more elegant. Also in April I ordered new window treatments for the living room, which ended up costing twice as much as I thought it would. I didn't realize how expensive window treatments can be, and I didn't even get very fancy ones. They better be worth it! I'm looking forward to getting them installed sometime in the next few weeks (although I'm a little nervous about it...what if they're not what I'd envisioned and we don't like them very much? We're stuck with them no matter what and because of their price they won't be getting replaced for a long time!). I love the blossoms on this tree in our yard. It's only in bloom like this for about two weeks out of the whole year!